I step from the Gautrain station into the airport and feel a little thrill of joy. A sudden sensation of well-being. I love this airport. The first of the Christmas lights are up. Twists of white lights along each railing, sprinkling the hanger-like space with sparkle. I don’t have time to pause above the international arrivals area today. If I was here longer, I would. Just to stop for a few minutes and people-watch. It’s my secret joy, the opening scene of Love Actually in real life – meetings, greetings, love and hugs. Today I trip past, run a quick errand, narrowly avoid a trolley-full of spinach, follow complaining south Americans up the escalator and head for check-in. Not too long to wait. I drop my bag and grab a paper. Past security, I wonder about a little airport shopping. There was a time when Exclusive Books concluded that domestic departures OR Tambo was my “home” store because I shopped there more often than anywhere else. They used to send me newsletters about it. No time today. Past the boarding gate, on the sky-walk, that little thrill of happiness hits again. 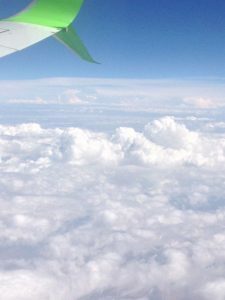 Up the steps, into the plane, find my window seat – always, for a Cape Town flight, especially. The plane is full but I have an empty seat beside me. I settle down and put my bag away. I’m smiling to myself. The taxi and the take-off. As we lift into the air, I feel relief. Breaking away from the ground and soaring into the sky. Leaving the earth and its worries behind. 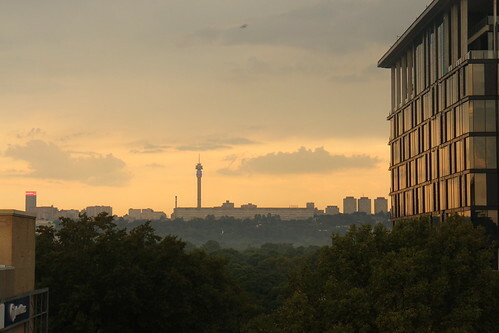 I look down on Joburg – green, now the rains have come – until it disappears below drifting clouds. Raising my eyes, I look up and out. This morning’s thunderstorm clouds. High, wispy ice-crystal clouds. Fluffy-white eiderdown clouds. We rise towards them and I wish were could go faster and be up there among them. Then we are. Up above the cloud-line, looking out at a world of white and the incredible blue of the sky. I take a deep breathe. I feel my body relax. Below, glimpses of fields and houses still exist through the clouds. Up here we glide soundlessly, the clouds and I. 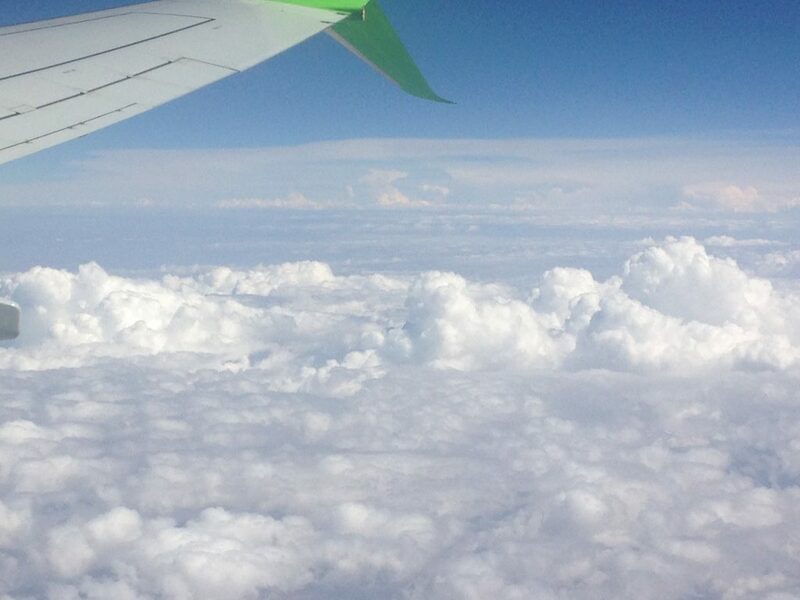 Somewhere over the Northern Cape, the cloud cover thins and I look down on a real live topographical map. A farm road angles and cuts through dry-looking land. There are a few fields near the road, stretching towards the red-grey-brown dirt. Two streams come together to form a small river that flows away, twisting and turning, into the distance. 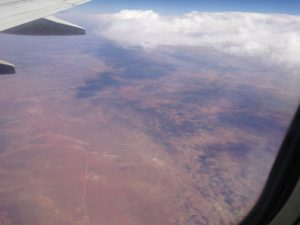 From up here, the land looks parched. A few minutes later, the earth disappears below the clouds again. First sight of the sea and Robben Island in the bay. From my seat on the right side of the plane, I’ve missed the sparkling blue of Gordan’s Bay on approach. Instead – a choice over and over again – the left turn reveal of the spectacular view of Table Mountain. Durbanville rises towards the top of the hill, green and pretty. Table Bay. Lion’s Head. With an elegant turn, the striking, familiar beauty of the Table Mountain massif itself. A few wispy clouds rest on top, like a table-cloth about to fall off. Over hostels and compounds and the plane comes in to land. We land with a bump – there is wind out there. The sensation of speed and resistance as we slow. The grass beside the runway is Cape Town summer-dry. In the distance, from the window of my earth-bound plane, the mountains are green-blue-postcard-picture perfect.